An overall impressive product from ergonomics manufacturer Ergotron. The WorkFit TX is the next in a line of standing desk converter products that have been notable for their sturdy work surfaces. This time Ergotron adds a descending and tilting keyboard tray as well as an impressively large work surface. The design is not without some faults, however. Work Surface: 32" x 27"
Keyboard Tray: 28" x 8"
We’ve got little to knock on this newest Workfit model, pretty much just the fact that we would have liked to have seen a steeper maximum tilt angle on the ergonomic keyboard tray. This is a refined product with every little detail worked out down to clean cable management niches and an easy up-down lift mechanism. 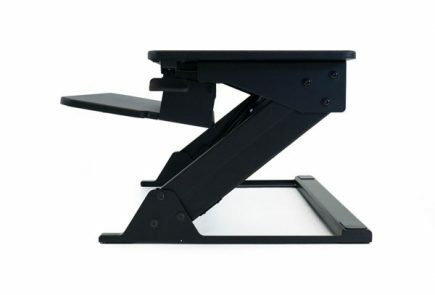 We’ve had the privilege of conducting sneak-peak reviews of Ergotron standing desk converters for the past few years. And our review staff have had the privilege of providing feedback to Ergotron’s product managers ever since they let us evaluate the first prototype of the first Workfit-T six months before its commercial release. In this most recent reveal of the upcoming Workfit-TX we can once again report that Ergotron’s engineers did a great job incorporating user feedback into their new top-of-the-line desktop converter. Our entire staff of expert reviewers got in on putting the prototype through its paces and seeing how it compares to the other models in Ergotron’s Workfit line, as well as competitors’ like Varidesk, ZipLift, Flexispot, and others. The lineage of this product line began with the launch of the Workfit-T in 2014 as the first widely-embraced “Varidesk alternative.” The unit’s solid X-lift design made it popular from the start, though customers with full-width keyboards didn’t take to the cramped keyboard tray. Ergotron responded with the wider TL unit the following year. In 2017 Ergotron responded to users and ergonomists who were clamoring for a descending keyboard tray by introducing the Workfit-TLE. 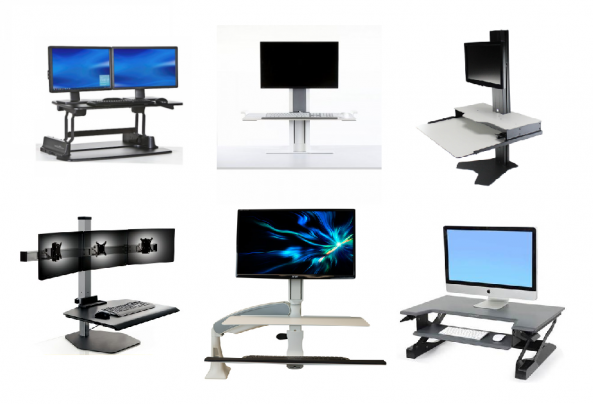 All of these models were built on the same basic frame that adds about 6” to monitor height when in the seated position, as do virtually all other X-lift and Z-lift designs. With the Workfit-TX Ergotron used some clever engineering to bring that 6” height adder down to just 2”, specifically to address shorter users who found the 6” added height of their monitors to be unergonomic. And there’s no denying the aesthetic benefit of having a low-profile converter on your desk. Ergotron's WorkFit TX rests only 2" above your work surface in the sitting position—an extremely low profile. To be candid, our guess is that the number of users who are so short as to be ergonomically frustrated with the standard 6” height lift of most X-lift and Z-lift desktop converters is in the low single digits. To our minds, the Workfit-TX has a lot of other things going for its design that you won’t find on any other desktop converter today. Let’s go through those other features and then talk about whether they combine to make the lofty $499 price tag on the Workfit-TX a good value for consumers and businesses. The feature we were most anxious to see was the new ergonomically keyboard tray that both descends below the desk surface and features an ergonomic negative tilt. Ergotron went a half step in the direction ergonomists (and we) were yanking them when they introduced a keyboard tray that could be adjusted to drop below the desk’s height with the Workfit TLE last year, but now they’ve committed to the second step of adding a negative tilt to that tray, as well. The WorkFit TX features a descending keyboard tray that also tilts for more ergonomic typing—although the tilting range is very limited. The tilt is added by flipping down a couple of plastic legs tucked away under the keyboard tray, similar to the ones you used to find along the back edge of PC keyboards before the PC industry figured out that the “positive” tilt was backwards and a “negative” tile is what ergonomists recommend. Simple enough. The problem—and this is our one big knock on the design—is that there is only one tilt setting on the Workfit-TX and it is only 6 degrees. This is too shallow to be of much ergonomic value, and less than you could achieve just by switching to an ergonomic keyboard like the Microsoft Sculpt. If you’re using a keyboard like the Sculpt this will give you a combined total of 13.5 degrees of negative tilt, which is a lot closer to the 15-20 degrees that ergonomists recommend. We could kind of appreciate Ergotron’s logic with not making the tilting surface any steeper, if their concern was keyboards and mice slipping off the smooth keyboard tray surface. However, this could be easily solved with the use of friction pads and/or back-edge fences as are used on other converters like the ZipLift. Regardless, the Workfit-TX officially joins a very exclusive club of converters that have a bona fide tilting keyboard tray feature, together with iMovR’s Cadence and ZipLift and Ergotech’s OneTouch. We hope to see many more jump into this fray as it has long been a shortcoming of Varidesk and their competitors. Footnote: we know there are users out there, some gamers, for example, who often like to put their keyboards on a positive tilt. While this is achievable on the aforementioned iMovR converters it is not a feature of the Workfit-TX. 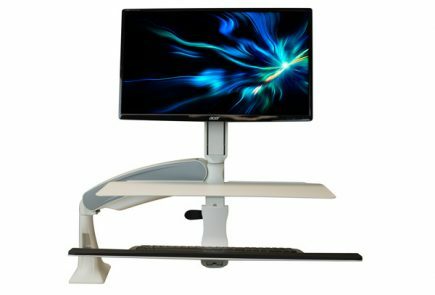 As we said earlier, most users find that they need a monitor arm on their standing desk converter, just as they would on a full sit-stand desk. But you can’t just take any old monitor arm and attach it to an Ergotron Workfit-T series converter (that goes for all the models: T, TL, TLE and TX). Not even a standard edge-clamped or grommet-mounted Ergotron LX monitor arm, of which there must be hundreds of thousands in use today. With the Workfit-T series Ergotron has created special monitor arms that mount to the surface top along the back edge of the converter. Aesthetically these arms look much more integrated into the design, though frankly this element is hidden by your monitors so not as big a deal as the fact that a single-LCD arm is only $99 and a dual is only $149—substantially cheaper than standalone Ergotron LX arms. There’s also a “hinged bow” upgrade kit for the dual arm (+$55) that allows you to turn screens inward to customize the viewing parabola, or turn a screen outward to share a view with others. They’re also inherently more stable than classic desk-mount monitor arms. But here’s the cool part… the Workfit-TX has not one but two mounting positions for the monitor post. Getting depth-of-field just right can be challenging with some desks and converters. Generally you want your monitors about 20” away from your eyes (as a rule of thumb as far as your outstretched arm), but these days so many people use multiple large LCD monitors that they need to be set further back to maintain a good aspect ratio, so it’s very handy to have the option of setting your monitor post at either 26.7” or 29.3” back from the front edge of the keyboard tray. A lot of the X-Lift and Z-Lift converters we’ve tested suffer from poor mechanical design and/or cheaply-made componentry. They either have too much slop in the mechanism (leading to instability), too many pinch points, or too many exposed greasy tracks that will quickly gunk up from accumulated dust. The TX's Lift Mechanism is extremely quiet, featuring a braking system that enables you to set your work surface height at any position you want (within its height range). The Workfit-TX’s lift mechanism is impressive. Not just because of its stability and height range (max of 19” above the desk) but its overall clean design. Quality components are used throughout, allowing Ergotron to confidently put a five-year warranty on this model. In all our testing we were able to get a little bit of movement on the mechanism only at the very lowest heights where no one would ever practically be using it, and certainly no instability could be measured at all while typing. The X-lift is infinitely adjustable in height. Unlike a Varidesk or even a Workfit-TL there are no “detents” to pop into. Wherever you set the height and release the brake paddles that’s where the TX will stay. While it’s not completely silent like a ZipLift the little bit of noise that the TX makes when rising or descending will not bother anyone around you. Reading Ergotron’s own marketing literature one gets the impression that they think they’ve accomplished with the Workfit-TX is shrinking the X-lift mechanism from 6” down to 2” in height. Yes, they can be proud of that achievement, but what we really like about it is the combination of a descending AND tilting keyboard tray, which we’ve been suggesting for years. Puzzlingly this gets no mention at all in their marketing materials. While the TX appears to have a very large footprint this is mostly an optical illusion. The unit even fits on only a 24”-deep desktop, which many units (e.g. Varidesk) cannot. The work surface extends forward of the user edge of the underlying desk by 3”, and then the keyboard tray adds another 6” in front of that, so all-in the user is typing on a surface that is 9” proud of their actual desk. Compared to using a conventional under-desk keyboard tray this distance is about the same, but the plus side is all the additional work surface area you get for papers, phones, etc. We’ve got little to knock on this newest Workfit model, pretty much just the fact that we would have liked to have seen a steeper maximum tilt angle on the ergonomic keyboard tray. This is a refined product with every little detail worked out down to clean cable management niches and an easy up-down lift mechanism. As with the other Workfit-T series units, the paddles are all the way at the front of the unit so that users with low back pain will have no problem at all lifting and lowering the unit. Another added benefit of the WorkFit TX is that the height paddles come near the front edge of the work surface, making them easier to reach and less straining on your back, since you don't have to lean forward to grab them. The Workfit-TL ships completely assembled though you will definitely need the help of a friend to slip it out of the box. Ergotron WorkFit TX is covered under a 5-year warranty for parts.